We’d love your help. Let us know what’s wrong with this preview of A User's Guide to the Brain by John J. Ratey. John Ratey, bestselling author and clinical professor of psychiatry at Harvard Medical School, here lucidly explains the human brain’s workings, and paves the way for a better understanding of how the brain affects who we are. 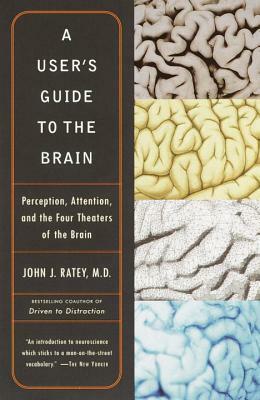 Ratey provides insight into the basic structure and chemistry of the brain, and demonstrates how its systems shape our perceptions, emotions, and be John Ratey, bestselling author and clinical professor of psychiatry at Harvard Medical School, here lucidly explains the human brain’s workings, and paves the way for a better understanding of how the brain affects who we are. Ratey provides insight into the basic structure and chemistry of the brain, and demonstrates how its systems shape our perceptions, emotions, and behavior. By giving us a greater understanding of how the brain responds to the guidance of its user, he provides us with knowledge that can enable us to improve our lives. To ask other readers questions about A User's Guide to the Brain, please sign up. در روزگاری که هرکس حقیقتی را برمیگزیند و هرکس روشی برای رسیدن به آن میدهد، شاید شناخت واقعی مسائل و شناخت درستی یا نادرستی مسائل فکری و فلسفی کار آسانی نباشد. اما نکتهای که جالب است و تقریبا هر دیدگاه و مکتبی به آن معتقد است، ضرورت شناخت خودمان است. در این میان بیراه نیست که بگوییم از هرمنظری که نگاه کنیم شناخت مغز و کارکردهای آن شاید ضروریترین جنبهی خودشناسی باشد، چون وجود و هویت انسانی خودمان را مدیون این عضو حیاتی و بینظیر خود هستیم. مغز مهمترین و پیچیدهترین عضو بدن است. بسیار پیچیدهتر از سایر در روزگاری که هرکس حقیقتی را برمی‌گزیند و هرکس روشی برای رسیدن به آن می‌دهد، شاید شناخت واقعی مسائل و شناخت درستی یا نادرستی مسائل فکری و فلسفی کار آسانی نباشد. اما نکته‌ای که جالب است و تقریبا هر دیدگاه و مکتبی به آن معتقد است، ضرورت شناخت خودمان است. در این میان بی‌راه نیست که بگوییم از هرمنظری که نگاه کنیم شناخت مغز و کارکردهای آن شاید ضروری‌ترین جنبه‌ی خودشناسی باشد، چون وجود و هویت انسانی خودمان را مدیون این عضو حیاتی و بی‌نظیر خود هستیم. مغز مهم‌ترین و پیچیده‌ترین عضو بدن است. بسیار پیچیده‌تر از سایر اندام‌ها. بدون شک رهبر و رئیس وجود جسمانی و غیرجسمانی ماست و همه چیز، از هویت و شناخت و آگاهی تا احساسات و عواطف ما تحت کنترل و اختیار مغز ماست. اصلا ادعای نابه‌جایی نیست اگر بگوییم مغز پیچیده‌ترین وجودی است که جهان به خود دیده است. کامپیوترها و سازه‌های انسانی هیچ‌گاه به پای مغز نمی‌رسند و حتا کیهان و شگفتی‌هایش نیز در مقابل مغز پیچیده‌ی انسان‌ها قابل فهم به نظر می‌رسند. شناخت علمی مغز از قرن نوزدهم آغاز شده و در تمامی این سال‌ها متخصصین زیادی سعی در شناخت آن داشته‌اند. دانش شناخت مغز، دوره‌های مختلفی را به خود دیده است. از زمانی که چون ماشینی دقیق درنظر می‌گرفتندش تا زمانی که فروید و پیروان مکتبش گزاره‌هایی همچون ابرمن و من را وارد این حوزه کردند و در سال‌های جدیدتر که علم اعصاب و شناخت نورون‌ها پیشرفت‌هایی زیادی در این زمینه به دنبال آورده است. بنابراین برای یک خواننده‌ی ساده که هنوز با اصطلاحات تخصصی آشنایی ندارد، شاید دنبال‌کردن این مباحث کمی سخت باشد. کتاب راهنمای کاربران مغز، در این زمینه شاهکار عمل کرده است. فصل‌بندی‌های خوب و موضوعات کاربردی و ضروری که در کتاب مطرح می‌شود، همه جذاب هستند. با خواندن این کتاب، تقریبا با چهارصحنه‌ی اساسی‌ای که ما به عنوان انسان با آنها درگیر هستیم و مغزمان عامل اصلی آنهاست، آشنا می‌شوید. این چهارصحنه چنانچه در این کتاب آمده‌اند عبارت‌اند از: ادراک، آگاهی، کارکردهای مغزی (مانند حافظه و عاطفه) و در نهایت شخصیت و رفتار. شناخت هریک از آنها و دانستن چگونگی عملکردشان حتا به صورت جزئی و ابتدایی می‌تواند تأثیر زیادی در شناخت ما از خود و ساختن زندگی بهتری برای خودمان و دیگران داشته باشد. در تمامی صفحات و فصل‌های این کتاب ۵۰۰ صفحه‌ای، حرف‌های خوب و جذابی گفته می‌شود، اما به نظرم مهمترین حرف این کتاب آنجاست که می‌گوید مغز مانند یک دستگاه و یک ماشین نیست که از پیش بدانیم چگونه عمل می‌کند. به‌علاوه روان و شخصیت ما نیز ریشه‌هایش به صحنه‌های اولیه‌ی مغز بازمی‌گردند و یک رفتار ممکن است نه نشان‌دهنده‌ی شخصیت ما، بلکه نشان‌دهنده‌ی مشکل و یا بیماری‌ای باشد که در مغز ما وجود دارد. در واقع بهترین تعریف این است که بگوییم مغز مانند یک زیست‌بوم است. همان‌طور که حتا کوچکترین چیزها نیز اهمیت دارند و باعث تغییر زیست‌بوم می‌شوند، برای مغز نیز کوچکترین رفتارها می‌توانند بااهمیت باشند و هر جزئی در رابطه‌ای پیچیده با جزئی دیگر قرار می‌گیرد و ضروری است که مانند یک محیط زنده به مغز نگاه کنیم نه صرفا مانند یک ماشین و دستگاه. مطمئنا خواندن این کتاب دریچه‌ی جدیدی است به نحوه‌ی تفکرمان نسبت به خودمان، و در کل نسبت به موجودی به نام انسان. در مورد ترجمه نیز به نظرم خوب است بگویم که فقط با خواندن متن انگلیسی کتاب است که متوجه می‌شوید مترجم با چه کتاب و با چه لحن پیچیده و نسبتا دشواری روبه‌رو بوده است و می‌شود گفت که قابل قبول عمل کرده است، به خصوص که موضوع اصلی کتاب نیز یکی از موضوعات تخصصی علم پزشکی است. با اینحال قبول دارم که ترجمه‌ی کتاب تاحدودی سخت‌خوان و غیرروان است، اما اگر کمی به شیوه‌ی ترجمه و علائم نگارشی (به خصوص ویرگول که بسیار پرکاربرد است) توجه کنید، حتما لذت بیشتری از خواندن این کتاب می‌برید. An amazing book that explains all the aspects of the brain in an intelligent, yet accessible way that is easily understood by the regular person. No need to have a Neuroscience degree to grasp this book - however it never talks down to the reader. Written by John J. Ratey, M.D., a clinical professor of Psychiatry at Harvard Medical School, this book touches on memory, language, movement, emotion and social ability and how our brain is "plastic" or changeable througout our lives. A study involvin An amazing book that explains all the aspects of the brain in an intelligent, yet accessible way that is easily understood by the regular person. No need to have a Neuroscience degree to grasp this book - however it never talks down to the reader. Written by John J. Ratey, M.D., a clinical professor of Psychiatry at Harvard Medical School, this book touches on memory, language, movement, emotion and social ability and how our brain is "plastic" or changeable througout our lives. A study involving a group of Nuns who lived on average, to be 100 years old and over, showed how this group had a much lower rate of Alzheimer's Disease and/or dementia associated with again, then the general population. The major difference? - learning. Constant learning throughout your life. Not only can an old dog learn new tricks - those new tricks can be the key to longer, more productive lives and a healthier brain. While practice may make perfect, it's new tasks that require us to master skills that we've never used before, that keep a brain growing and making new neural connections. A very well structured and precise introduction to Neuroscience/Neuropsychology. I have been reading similar books, this one in particular was recommended from my Neuropsychology's professor, and though I didn't learn anything new, I quite enjoyed the way it was structured, every chapter covers a cognitive process or a psychological topic like development. Therefore, if you are struggling with neuroscience or want to learn about it in a cool and easy way, this is a very good option, it covers a lo A very well structured and precise introduction to Neuroscience/Neuropsychology. Ratey stresses the neurological, systemic, and plastic nature of brains. He argues that behavioral problems often start with perceptual ones. I picked up A User's Guide to the Brain from a library booksale. As someone with brain problems of some variety, I've developed a strong interest in finding out how brains actually work. Ratey does a good job of balancing actual science with writing that is easily understandable. I appreciated his non-judgemental and hopeful tone, and I found some of his insights really useful, especially regarding the importance of motor centres in the brain and the connection between movement and thinking, the I picked up A User's Guide to the Brain from a library booksale. As someone with brain problems of some variety, I've developed a strong interest in finding out how brains actually work. Ratey does a good job of balancing actual science with writing that is easily understandable. I appreciated his non-judgemental and hopeful tone, and I found some of his insights really useful, especially regarding the importance of motor centres in the brain and the connection between movement and thinking, the role of emotions in decision making, and the plasticity of the brain. I finished this book feeling like I understood more about myself, others, and will be able to use some of these insights to fine-tune routines in my life to help out my brain. My dissatisfactions with the book are mainly these: after a throwaway comment that no one is born gay, Ratey never speaks of homosexuality again. This book was written in 2002, but it's still annoying, especially to myself as a lesbian. And a quick google search does show there has been evidence for homosexuality showing up in different ways in the brain. Very engaging at times, though I felt it dragged a bit in the middle. Much fascinating information. Easy to appreciate, this relatively non-technical yet non-dumbed-down little introduction to the physiology of our noggins and, of course, selves. If you've just learned some new vocabulary words or are trying to integrate information, you have to get some REM sleep in order to truly learn the new material. Language development can be conceived as a simple resu Very engaging at times, though I felt it dragged a bit in the middle. Language development can be conceived as a simple result of humans' unique ability to create and understand symbols. Ratey writes beautifully about infants' innate ability to understand beings as discrete entities with different information and the ability to deliberately share it. I like Ratey's positive spin, which persists throughout, on our potential to rewire our brains and change ourselves throughout life. I believe him, somehow, probably as much because he writes as though convinced as for the facts he uses to support this argument. As someone with no prior background or experience in neuroscience or psychology I found this book a fascinating insight into the complexities of the brain. The author initially sets out his goal of providing an accessible read to all by eschewing complex medical terms for easy to understand concepts through metaphors. These certainly provide a fantastic level of accessibility but at the expense of a certain level of repetition. I think the intended target of this book is freshman undertaking studi As someone with no prior background or experience in neuroscience or psychology I found this book a fascinating insight into the complexities of the brain. I think the intended target of this book is freshman undertaking studies in neuroscience, demonstrated by the significant amount of references to studies, papers and research. This book provided me with enough information to grasp a solid understanding of the fundamentals of neuroscience whilst giving me ideas of where I can direct my efforts for further reading and study on related topics, some of which I intend to explore further. "The idle mind is the devil's plaything"
The idea for this book was excellent: take all of the intricate, ground-breaking information in neuroscience and psychology, simpify it as much as possible to educate every-day readers, and add a "how to" component to show the information's practicality, importance, and usefulness. Coming from an author and clinician as well established as John Ratey (he works at Harvard), I expected nothing less than an intelligent, compelling book. A User's Guide reads like a condensed version of my freshman year cousework in Brain & Cognitive Sciences. Ratey provides explanations of each basic neuroscience concept (e.g. synapses, "use it or lose it," plasticity, etc.) as he goes through his material, all of which are essential to understanding and being convinced of his argument that we can change the neuroanatomy and therefore functionality of our own brains. However, Ratey may as well have physically taken his book and bashed his readers over the head with it repeatedly, because that is what he does with every point he makes. Instead of providing one paragraph of neuroscience explanation and then a follow-up paragraph or two about how this anatomy or functionality works in practical terms and/or how it can be manipulated by a "user," he spends pages going over and over each concept in every synonamous way he can conceive. By the end of the first chapter, I was less convinced of his argument that people can change their own brains by "thinking right" and more convinced that he was trying to create a memorization aid for neuroscience students. Ultimately, I got so fed up with the repetition that I quit the book. (A reader can only skip so many paragraphs, after all, before deciding to "skip" the remainder of the book.) I am sure there are other books out there on this same topic that are more entertaining and less tiresome. Ratey seems like he knows his stuff, and--as I am already familiar with the material--he seems to explain it well. However, as good as his explanations might be, there IS something to be said for too much of a good thing. And A User's Guide was definitely too much. One of the best and first psychology books I've ever read. This book has transformed my life. It has inspired me to immerse myself in the world of the human mind. I highly recommend this book to anyone interested in psychology. Honestly, most people would expect this to "just be another boring science book" but I in fact quite enjoyed it. Not only does it give factual info in a fun way but it also includes actual stories about what the chapters are about, not just cold hard facts. would I recommend this book to others? Definitely! Its a great book and interesting to boot. Wonderful overview of brain structure and function including the Four Theaters concept of integrated function. Well worth the read/listen. اگر ميخواهيد فقط يك كتاب درباره ي علوم اعصاب بخوانيد، همين كتاب عالي است. "The point to remember is that the issue is not nature versus nurture. It is the balance between nature and nurture. Genes do not make a man gay, or violent, or fat, or a leader. Genes merely make proteins. The chemical effect of these proteins may make the man's brain and body more receptive to certain environmental influences. But the extent of those influences will have as much to do with the outcome as the genes themselves. Furthermore, we humans are not prisoners of our genes or our environment. We have free will. Genes are overruled every time an angry man restrains his temper, a fat man diets, and an alocholic refuses to take a drink. On the other hand, the environment is overruled every time a genetic effect wins out, as when Lou Gehrig's athletic ability was overruled by his ALS. Genes and the environment work together to shape our brains, and we can manage them both if we want to. It may be harder for people with certain genes or surroundings, but "harder" is a long way from pedetermination." Ratey recounts several stories of patients who spent their life treated like they were dumb, afraid, slow, and or nervous...only to discover they had blurry vision for things that moved (so reading or catching a ball was extremely difficult), or lacked the capacity to envision long-term results. Some were tragic stories, some amazing. This book really opened my eyes to a lot of possible physiological reasons people might behave the way they do, which helped me get a grasp on why it is that I need to be a lot easier on people than I tend to be. It also gave me a great deal of education on matters of things to watch for that might indicate someone may have one of these issues. Ratey was a required reading for HUMAN BEHAVIOR 836, I enjoyed reading it much more than I originally would have thought. His cadence and scientific insight makes this introduction to neuroscience a thought-provoking read. He divides his writing by our brain's capacities and 'powers' and adapts them to the current theories in the field of psychiatry. What makes this book readable is his ability to weave in personal experience as a clinician. He provides many examples on how the brain can overreact, compensate for trauma, develop deficits and explain the exciting possibilities of plasticity. I wouldn't pick it u p 4fun but it was worth reading for any class. This really was a fascinating book, and I learned a lot. However, it took me a long time to get through the middle of this book. The vocabulary (even though it's "dumbed down") made my head reel a bit. There were good diagrams scattered throughout that were references for the different parts of the brain he happened to be discussing at the time, but they weren't very useful to me. If I could have had a diagaram of the brain light up each time he talked about a specific area, I think I would have This really was a fascinating book, and I learned a lot. However, it took me a long time to get through the middle of this book. The vocabulary (even though it's "dumbed down") made my head reel a bit. There were good diagrams scattered throughout that were references for the different parts of the brain he happened to be discussing at the time, but they weren't very useful to me. If I could have had a diagaram of the brain light up each time he talked about a specific area, I think I would have been able to process things a lot better (though I realize that's not quite realistic). This book provides a good overview of some of the current research on the brain. However, I was a little skeptical about some of Ratey's claims. He stated a few times that a theory was "proven", but anyone who has studied science knows that researchers don't "prove" theories, they gather evidence to support them. The basis of the scientific method is that researchers attempt to disprove a hypothesis, and if they fail to do so, it becomes a theory. I suppose I'm just being picky about language, t This book provides a good overview of some of the current research on the brain. However, I was a little skeptical about some of Ratey's claims. He stated a few times that a theory was "proven", but anyone who has studied science knows that researchers don't "prove" theories, they gather evidence to support them. The basis of the scientific method is that researchers attempt to disprove a hypothesis, and if they fail to do so, it becomes a theory. I suppose I'm just being picky about language, though, since this was meant to be for the laymen. Even so, some of Ratey's claims seem exaggerated and unsubstantiated. For example, Ratey claims that the average high school graduate knows 60,000+ words, when the true number is closer to 10,000 words. Ratey was probably siting a linguist who counted the same word several times because one word may have multiple definitions and may be used as multiple parts of speech. I wish the author would have been clearer about these nuances. I enjoyed how well the author articulated some of the shortcomings of the current method of diagnosis based solely on personality and behavior. The discussion on the four theaters of the brain and how they interact was very insightful. The author's philosophy of a more holistic approach to therapy is along the same lines that I have been thinking lately. Some of the discussion of the different brain systems were a little too detailed and difficult for me to focus on. However, the strength of this I enjoyed how well the author articulated some of the shortcomings of the current method of diagnosis based solely on personality and behavior. The discussion on the four theaters of the brain and how they interact was very insightful. The author's philosophy of a more holistic approach to therapy is along the same lines that I have been thinking lately. A great pre-date book or pre-dinner party book. Seriously. I'm not kidding. "...lust is associated primarily with estrogen and androgens. Attraction, however is associated with elation and a craveing for emotional union, which may be linked to the monoamines such as serotonin. The Neurotransmitters associated with long-term attachment--a behavior evidenced by close body contact, separation anxiety, and a sense of calm, security, and pea A great pre-date book or pre-dinner party book. Seriously. I'm not kidding. Had I not found the author's style so confusing, I would have given this 4 stars, not three. I think I owe it a re-read and am going to mark it as such. As a neophyte in this area, I would have done better with more in the way of straight-forward vocabulary and physiology and less in the way of cute anecdotes, most of which were interesting, but some of which verged on the six year old's shaggy dog story that has neither end nor beginning. Perhaps it will hold up better on re-read, we shall to s Had I not found the author's style so confusing, I would have given this 4 stars, not three. I think I owe it a re-read and am going to mark it as such. As a neophyte in this area, I would have done better with more in the way of straight-forward vocabulary and physiology and less in the way of cute anecdotes, most of which were interesting, but some of which verged on the six year old's shaggy dog story that has neither end nor beginning. This is one of the best books I've ever read on the human mind/brain. It is organized really well and easy to understand. I have used it for teaching related to dementia based on the idea that it is helpful to understand how a healthy brain works before understanding what can happen when disease sets in. Someone borrowed my copy and never returned it. Boo hoo! This is a good reminder to order it now while it's still fresh on my mind. Hey Goodreads is not only fun but useful. Dr. Ratey and Dr. Hallowell began studying ADHD in the 1980s and co-authored Driven to Distraction: Recognizing and Coping with Attention Deficit Disorder from Childhood through Adulthood (1994), the first in a series of books that demystify the disorder. Dr. Ratey also co-authored Shadow Syndromes (1997) with Catherine Johnson, PhD, in which he describes the phenomenon of milder forms of clinical Dr. Ratey and Dr. Hallowell began studying ADHD in the 1980s and co-authored Driven to Distraction: Recognizing and Coping with Attention Deficit Disorder from Childhood through Adulthood (1994), the first in a series of books that demystify the disorder. Dr. Ratey also co-authored Shadow Syndromes (1997) with Catherine Johnson, PhD, in which he describes the phenomenon of milder forms of clinical disorders. Dr. John J. Ratey, M.D., is an associate clinical professor of psychiatry at Harvard Medical School and has a private practice in Cambridge, Massachusetts.